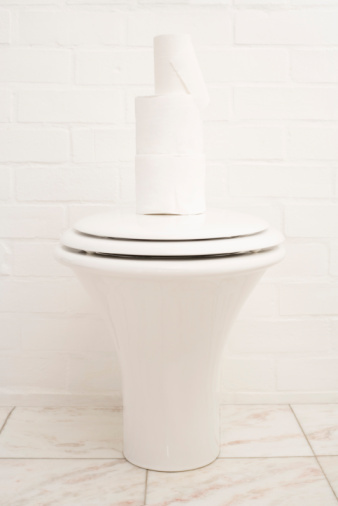 If you're looking for a quick bathroom makeover, one of the things you can do is replace your toilet. Although there are a number of different toilet manufacturers, including Toto, removing a toilet is essentially the same process no matter who makes it. Once the water is shut off, the tank is disconnected from the bowl, and then the bowl can be removed. Removing a Toto toilet is a good project for a DIYer looking to gain some plumbing experience. Cut the water supply to the tank for the Toto toilet. Look for a flexible hose connected underneath the tank at the rear of the toilet. Follow the hose to locate the supply valve. Rotate the handle on the supply valve all the way to the right. Remove the lid on the Toto tank. On a dual-flush toilet, unscrew the trigger at the top by turning it counterclockwise before removing the lid. Press down on the handle to flush out the water inside. Continue holding the handle down to keep the flapper open and let the rest of the water out. For a dual-flush tank, press the trigger at the top of the siphon in the middle of the tank. Mop up any remaining water with a sponge or towel. Loosen the coupling that connects the supply hose to the underside of the Toto tank. Slip a wrench around the nuts on the underside of the tank and loosen them. Pull the tank up and off the back of the toilet. Pry off the caps at the base of the Toto toilet bowl, using a flat-bladed screwdriver. Loosen the nuts at the base with a wrench. Run a sharp utility knife around the base of the toilet bowl. Use your hands to wobble the toilet bowl back and forth until you feel it start to come loose. Pick up the bowl and lift it off the toilet flange. Remove the bowl bolts from the toilet flange.